The Kaavad is a painted, wooden shrine illustrating visual narratives on multiple hinged panels. It is created to resemble the opening thresholds of a Hindu temple on an intimate scale. The portable shrine unfolds and is accompanied by a storytelling performance. Many illustrations come from the epics of the Mahabharata and Ramayana, along with genealogies and local stories of gods and goddesses, heroes and patrons. The Kaavad makers are known as Suthars (meaning 'carpenter') and reside in Bassi village in Rajasthan — although now only a few families continue this practice. Satyanarayan Suthar is one of these artists, and creates unique shrines of varying scales and subject matter. 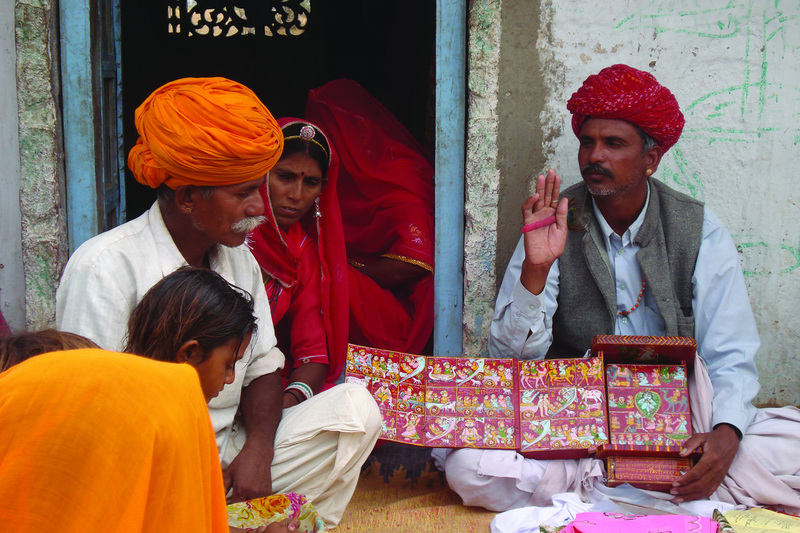 Originally, the shrines were made specifically for a community of storytellers called Kaavadiya Bhats from the region of Marwar, who would carry them to each village. This storytelling aspect still exists, but the shrines are also made as objects in their own right, and now incorporate illustrated elements, such as cars, planes, computers and other features of everyday life.